Join me on a psychoanalytic journey of the Milky Way. I try to tell a simple story of the psychoanalytic dreamtime that can be understood by many using metaphors and language associated with dreaming. When you have finished reading The Milky Way you will have some understanding of the key beliefs and practice of psychoanalysis. 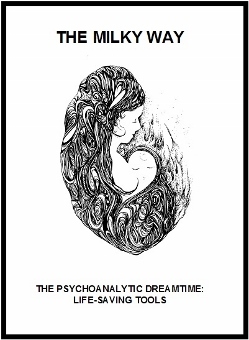 In this booklet difficult words commonly used in psychoanalysis will be explained. Language from the Arrernte Aboriginal people of Australia is also used. Words like jilpie means elder. Aboriginal words will be italicised. The stars of the Milky Way, our galaxy, take us from night to day. Psychoanalysis takes us from the darkness of the unconscious to the light of knowing and understanding who we are and who we can be. The mind and our formation as a people are like The Big Bang, the black voids, the sun, the supernova and the celestial sphere. How are these elements like the mind? Each emerges from a mystery, to become real and embody an action or way of seeing the world. Our mind can be bright and expansive like the sun or dull and retracting like a void. By reading this booklet you might learn something that will change your mind and save your life. You might find your life can be an ordinary journey of the extraordinary and filled with emotional dances and stories spinning into starry galaxies. Who knows you might even want to sign up for some psychoanalytic psychotherapy. How can we get to know this unknown world? How do we get to know our phantasies? What’s so important about the Mother-Babe relationship?